(PhysOrg.com) -- For the first time, MIT engineers and colleagues have observed the initiation of a mass gathering and subsequent migration of hundreds of millions of animals — in this case, fish. The work, conducted using a novel imaging technique, "provides information essential to the conservation of marine ecosystems that vast oceanic fish shoals inhabit," the team writes in the March 27 issue of Science. It also confirms theories about the behavior of large groups of animals in general, from bird flocks to locust swarms. Until now those theories had only been predicted through theoretical investigations, computer simulations and laboratory experiments. For example, the team found that once a group of fish reaches a critical population density, it triggers a kind of chain reaction resulting in the synchronized movement of millions of individuals over a large area. The phenomenon is akin to a human "wave" moving around a sports stadium. "As far as we know, this is the first time we've quantified this behavior in nature and over such a huge ecosystem," said Nicholas C. Makris '83, PhD '91, leader of the work and a professor of mechanical and ocean engineering. The resulting shoals of migrating fish can extend some 40 kilometers or approximately 25 miles across the ocean. Makris' principal collaborators on the work include Purnima Ratilal PhD '02, a professor at Northeastern University, J. Michael Jech of the Northeast Fisheries Science Center, and Olav Rune Godoe of the Institute of Marine Research in Norway. Other collaborators are from MIT, Northeastern and the Southeast Fisheries Science Center. 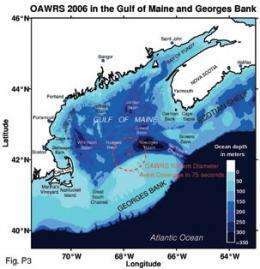 The researchers focused on Atlantic herring off Georges Bank near Boston during the fall spawning season. They found that the formation and movement of large shoals of the fish constituted a kind of daily evening commute to the shallower waters of the bank where they spawn under cover of darkness. Come morning, the fish head back to deeper water and disband. The work was conducted using Ocean Acoustic Waveguide Remote Sensing (OAWRS). In 2006, Makris and colleagues published a paper in Science introducing OAWRS, which they invented, and initial observations made with it. OAWRS allows the team to take images of an area some 100 kilometers (approximately 62 miles) in diameter every 75 seconds. This is a vast improvement over conventional techniques such as fish-finding echo-sounders, which Makris compares to "watching one pixel on a movie screen" while the new technology allows you to "see the entire movie." 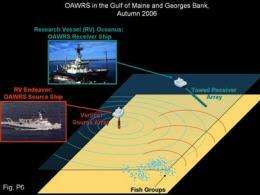 Both OAWRS and conventional methods rely on acoustics to locate objects by bouncing sound waves off of them. With conventional techniques, survey vessels send high-frequency sound beams into the ocean. In contrast, the new system uses much lower frequency sound that can travel much greater distances and still return useful information with signals far less intense. Makris sees potential in using OAWRS to better monitor — and conserve — fish populations. Large oceanic fish shoals provide vital links in the ocean and human food chain, he explained, but their sheer size makes it difficult to collect information using conventional methods. Ron O'Dor, co-senior scientist of the Census of Marine Life (CoML), commented that "OAWRS allows us to gather information such as geographical distributions, abundance and behavior of fish shoals and to better understand what constitutes healthy fish populations ... which can be implemented by policymakers to better monitor and improve conservation of fish stocks." CoML is an international scientific collaboration engaged in a 10-year initiative to assess and explain the diversity, distribution and abundance of marine life in the oceans. It aims to release the first Census of Marine Life in 2010. Could OAWRS be exploited to find and take more fish, rather than conserve them? Makris believes that it would be virtually impossible. For example, he said, it cannot be used in stealth. "Thieves do not like to work in broad daylight or with the lights on, and OAWRS [essentially] turns the lights on in the ocean making it possible for everyone to see what is happening there and do something about it." He also emphasized that permission from each government would be needed to use it in any nation's territorial waters or in internationally regulated waters.